EVERY SINGLE one of our shows has a reference to Champ 01/02 so Justin and I chat for a (very long) about the best game ever to be invented. Best moments, worst moments and the hardest job of all, choosing a best 11. It all goes well, but i fear we have made one huge omission. 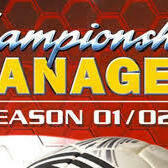 For info on the game including a free download go to https://www.champman0102.co.uk/ ( these are the proper experts).